Join m|f designs at the Studio Around the Corner in Brewster, NY on Friday, April 12th at 7pm! We will guide you step-by-step in creating your very own beautiful personalized serving tray! These make for a great piece to add to your home decor or to give as a gift! You choose the stain color as well as the text color! All proceeds from this event will go towards the restoration of the Old Town Hall Theater. Each ticket is $40 and includes all materials and instruction. Get your tickets HERE! This event is BYOB so bring whatever you'd like! Join m|f designs at The Studio Around The Corner in Brewster, NY on Tuesday, April 16th at 3:30pm! Drop your child(ren) off and we will show them step-by-step in creating their very own personalized sign for their bedrooms! Get Tickets HERE! Tickets are $30/child and include all materials, step-by-step instruction, and a light snack! This event is for children ages 9+ but younger children can attend if a parent/guardian stays to help them out a little bit! Please be sure to double check that the initial is correct and that the spelling of your child(ren)'s name is accurate when purchasing tickets! Please be sure to have your child dress in clothing you don't mind them getting a little paint on. We do provide smocks but it's hard to be so careful when you're having fun! m | f designs is an art party and event business run by two friends and fellow art lovers, Maureen and Frannie. Specializing in unique and fun projects, they hold exciting public arts and crafts events monthly and host private parties at homes and businesses. They are also available for any custom piece requests. Sign up for public events anytime or create your own party! Choose from an array of projects or customize your own, totally unique party with friends or coworkers. From canvas to wood to glass painting and more! CLICK HERE to e-mail if you have any questions. 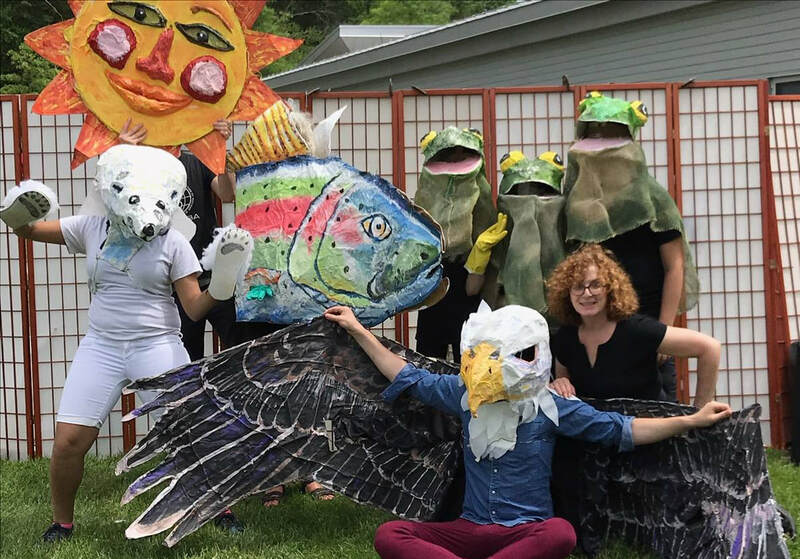 Celebrate Earth Day with Earth Puppets! Large scale puppets bigger than people made with recycled stuff! Two delightful original tales about global warming and bees. A lost Polar Bear finds himself in the Great Swamp in Putnam County NY. And is saved by frogs and fish. Bees are threatened by the destruction of their flowers. But are saved by their friends. Rebecca Rabinowitz, Patterson resident, artist and theater person is the creative force behind the performance. Rebecca’s inspiration for the puppets and performance was the need to express concerns about the environment. Global warming and insecticides threaten all living creatures and the careful balance in our environment. The goal is to communicate these concerns in a format that is fun, positive; theater and puppets! Local actors, students, musicians perform. Poetry Out Loud - Saturday May 4th, 7pm - 10pm. On May 10th and 11th at 7:30pm come and join us for a cabaret performance with all the feels. Songs of joy and sadness, power and passion, love and loss, sung by amazingly talented people from around the area. You will be treated to some of the most beautiful and exciting music across the genres. Seating is VERY limited, get your tickets HERE today!